This morning, I was horrid. My day started off as it usually does. After a restless night interrupted by thunderstorms, I staggered into my kitchen to assist the dog with her morning ablutions (although neither water nor cleanliness was involved). If she could use her paws to open the door, I wouldn’t ever have to get out of bed before 6 am, because she could probably also open the dog food bin. She drinks out of the toilet already, so, as long as the lid is up, I’m good there. Having opened the door for her, filled her food dish, and mashed her anti-histamine into a marshmallow, I opened the freezer to pull out my two daily frozen waffles, and…nothing. No waffles. I was suddenly wide awake and hurried to the storage freezer in my pantry…again…nothing. No waffles. I had consumed an entire 60-count package of frozen “homestyle” waffles from the Big Box Store without realizing it. Waffles and pizza are the only carbs that I eat regularly, so I had no bread, no cereal, no pre-packaged cookies or crackers in my house. No potatoes. Just bars of dark chocolate, raw veggies, half of a leftover crab cake, and several bottles of wine in my refrigerator. I returned to the freezer, moving aside frozen meat and frozen leftover pizza and frozen fresh pasta (an oxymoron, I know), certain that I had overlooked some stray waffles. That’s when I spied the package of frozen chocolate chip cookie dough. Bells went off in my head, while stars streaked from the package. Breakfast! Sure, they contain all that fat and sugar and chocolate, but with pecans added, they’re actually as nutritious as most granola bars! “You couldn’t eat the frozen pizza?” The Shrew sighed. “But I could faint from lack of food, run off the road, and kill someone.” There was a pause in my thought process. “Ok, ok,” I started pulling the package out of the drawer. 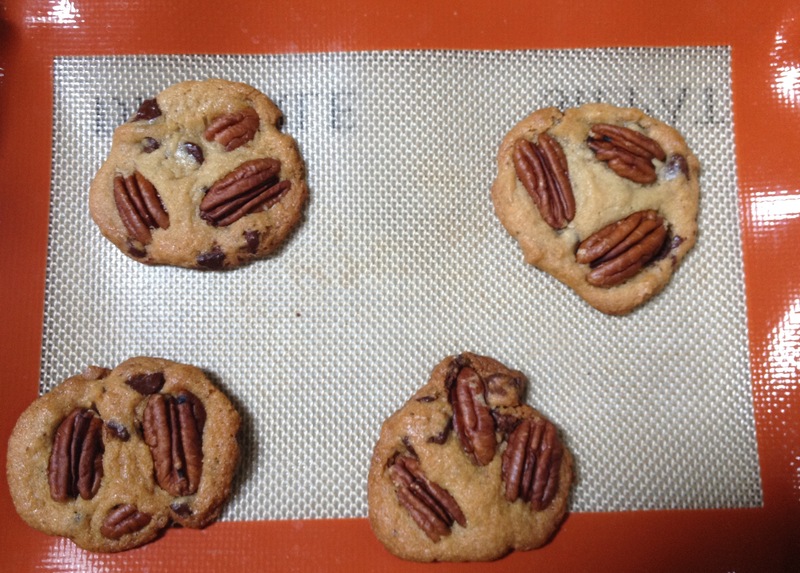 I can’t eat cookies without pecans, so that was easy. “And you do two Zumba sessions and 5 minutes of planking.” My penance. “Ok, ok,” I panted. Cookies for breakfast! In the end, I made four cookies because they come in a neat block of four squares, so, if I cut off just two, the other two would probably get freezer burn. Fortunately, The Shrew had rolled over and gone back to sleep. Marriage was the hardest thing I ever did in my entire life, resisting the urge to up and leave when The Veterinarian looked at me cross-eyed. I will never forget wanting to bolt one month after our wedding. Full-time college students, we had been arguing in the car on the way home. I couldn’t tell you what it was about, but, when we got into the privacy of our apartment, I burst into tears. “I can’t do this,” I cried. “I just can’t do this. I can’t stand you. I can’t stand this tiny apartment. You don’t listen to a thing I say to you. You just do whatever you want, as if my opinion doesn’t matter. You brought a dog into the house without asking me, and you know I’m afraid of dogs. I can’t stand the thought of doing this for the rest of my life.” He stood in front of me, completely befuddled. He thought everything was great. “I’m sorry,” he began, “I didn’t know.” He put his arms around me, sat us down on the sofa, and cradled me in his arms. I sobbed uncontrollably into the collar of his shirt. I couldn’t tell you what he said or what I said to smooth things over. I remember that we both felt the enormity of the commitment that we had made. I remember that my mascara didn’t wash out of his shirt, that a perfect set of my eyelashes was imprinted on the collar. When the shirt went out of style, I hung it in the back of my closet and moved it across the country to remind me of my commitment, a more meaningful reminder than the gold band on my finger. I’d love to tell you that our marriage got easier, but it didn’t. The arguments were always the same, for the 39 years we were married. At the 10-year mark, like Ben and Jen, we were building our own veterinary hospital. It was a strenuous nightmare, and I did think I was going to leave him. Then, it got worse, and we talked about divorce. The meadow looked like it might exist somewhere else, but we kept coming back to that promise of commitment. We knew the Alpine meadow was a fantasy. We knew that being present over the long haul far outweighed mad passionate love among the flowers. Besides, my bare skin can’t handle direct contact with vegetation. It’s none of our business what other people do in their marriages unless we see abuse that needs intervention. When they say, “We still love each other” they may be covering up bigger issues that are none of our business. It just makes me sad that marriage gets a bad rap, that it’s taken so lightly. The Wedding is the all-important moment in most of the marriages that I see. Parents mortgaging their homes for their daughter’s “Dream Wedding.” The bachelor parties in Vegas, the Bridezillas, the Destination Weddings, the expensive favors and liquor and entertainment. I wish they’d focus on what marriage really means. I wish they’d spend more time asking God to guide them, instead of a complete stranger in a meadow or a beach or a bowling alley or a hotel ballroom who isn’t going to be there when you don’t think you can spend one more day with the person to whom you’ve committed your life. I promise them that it is all worth the love and friendship and aggravation and commitment. As usual, I digress, again. Well, those cookies were good, but, now, I sit here contemplating the two sessions of Zumba. Exercise is a lot like marriage. You have to do it even when you don’t want to, so you have to make it work for you. Maybe I could only do one Zumba session and walk the trail with the BFF. It’s a nice day. The sun is shining, and there’s a breeze, so who am I to complain? Life is good (mostly). Soli Deo Gloria! Categories: Food, Marriage | Tags: cookies, Marriage | Permalink.